The term 'Oxbridge' is used to refer to the universities of Oxford and Cambridge. Oxford and Cambridge are the oldest universities in the UK. They both offer undergraduate and post-graduate study, and are both split up into colleges, which organise students' accommodation and tuition. Students live, work and socialise within colleges, although university-wide faculties also offer further facilities such as lectures, laboratories and libraries. The institutions often top university league tables, and as a result both have strict admissions criteria. According to Oxford University, for example, 99.8 per cent of its students achieve A-level scores of AAB or better. Oxford has 39 self-governing colleges, and 6 permanent private halls (small colleges which usually have a Christian affiliation). 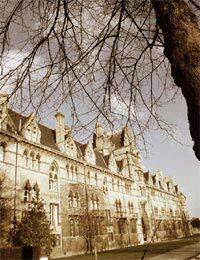 The oldest colleges are University College, Balliol College, and Merton College, which were established by the 13th century. The colleges vary greatly in size - St Catherine’s is currently the largest, with around 704 students, while some colleges and several PPHs have fewer than a hundred students. From 2008, all Oxford colleges accept both male and female students. Eight colleges - Green, Linacre, Nuffield, St Antony’s, St Cross, Templeton, Wolfson and Kellogg - accept only graduate students. Cambridge has 31 self-governing colleges. The oldest existing college is Peterhouse, which was established in 1284. Three Cambridge colleges accept only women: Murray Edwards (known as New Hall until 2008), Newnham and Lucy Cavendish. Clare Hall and Darwin colleges admit only postgraduate students, while another four colleges - Hughes Hall, Lucy Cavendish, St Edmund’s and Wolfson, admit graduates and mature students (those aged 21 years or older at the start of their first term). Like Oxford, Cambridge also has departments, faculties and schools (over 150) which organise teaching and research in the university. In the first instance, all Oxford and Cambridge candidates must go through the usual UCAS application process, but must adhere to an early deadline, usually in the second week of October. Students can only put one course as one of their UCAS choices, and cannot apply to Oxford and Cambridge in the same year. During the application process, candidates may choose to apply to a particular college or may apply ‘open’ and be assigned a college. Each subject has different admissions requirements, as well as English language skills, which are listed on Oxford’s and Cambridge's website and in its printed prospectus. Each subject also has a different admissions process. Some subjects require two samples of written work; the deadline for this is usually the second week in November. Oxford then shortlists some candidates, who are invited to interviews. The shortlist is based on academic record, predicted or received grades, academic reference, personal statement and required written work or tests. Around 75 per cent of applicants are interviewed, in December each year; some subjects also require candidates to take further tests. Candidates are then informed of their success (or not) in late December or early January. Offers will usually be conditional on certain grades at A Level or similar examinations, if these have not yet been confirmed. The application process to Cambridge in simalr to Oxford in that each subject has its own admissions process. Some subjects require candidates to take written exams, such as the BMAT or LNAT or the Thinking Skills Assessment or a subject-specific test carried out while in Cambridge for interview. Candidates who are invited to interview are called to Cambridge in the first three weeks of December. Applicants then find out the outcome of their application towards the end of December or early January. There are three possible outcomes: an offer, rejection, or a ‘pooled’ application. This means the first-choice college does not have space available but your application may be accepted by another college. Some pooled candidates are invited for further interview; others may be offered a place without another interview, and some may be rejected after being pooled.